Multiple, one time use claim codes (recommended). Known as “one time use claim codes or promo codes” in Amazon. We recommend you take a look at our guide, and especially closely follow the ‘Single-Use Multiple Code Promo’ tutorial. 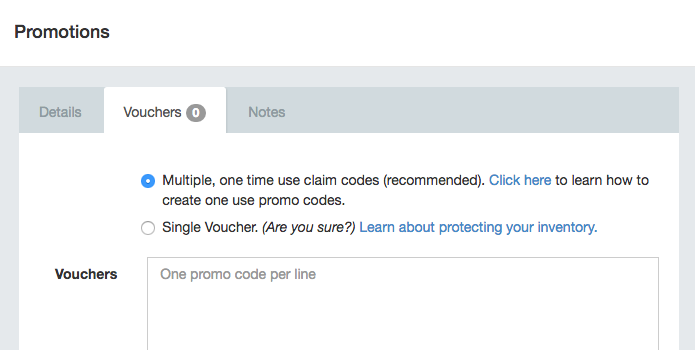 How to create single use Amazon promo codes THIS IS SO VERY IMPORTANT. FOLLOW DIRECTIONS EXACTLY! Yes, the promotional codes are still valid up until the expiry date which you set up from Amazon. So, don’t worry, even if your promotion has ended, your shoppers that were issued a code, can still complete the purchase. 4. Why Some Shoppers Don’t Use Your Code! 5. How Can I Tell How Many Codes I’ve Sent or Have Left? Go to the ‘Vouchers’ tab. This keeps a count of the number of vouchers you have left. Subtract this from the number you started with & this will tell you how many you’ve issued. Just remember that when you are trying to track sales numbers, make sure you do it from the codes used, not used because sometime the shoppers don’t follow through with the purchase. See the reasons here.